Implant-supported fixed complete dentures are for the person who is losing or has lost all upper and/or lower teeth but does not want to wear a removable denture. With advancements in technology and techniques, your failing teeth can be replaced immediately (in one day) by placing four or more dental implants in your jaw and attaching this type of prosthesis. In comparison to conventional dentures, these beautiful and functional teeth are sure to improve your confidence, self-esteem, and quality of life. No dentist is more qualified to provide this type of treatment at a higher quality than a prosthodontist, like Dr. Tyler. As a Certified Dental Technician (CDT) before he became a dentist, Dr. Tyler gained invaluable experience, working several years in a dental lab. As a lab technician, he specifically specialized in fabricating crowns and bridges for both teeth and dental implants. These experiences are noticeable when you receive the technically proficient treatment he provides for his patients, particularly when doing implant-supported fixed prostheses. “Teeth in a Day” is a phrase used to describe the process of receiving new teeth or a new smile by delivery of a temporary (interim) implant-supported fixed prosthesis the same day dental implants are placed into your jaw. This process is also known as “Same Day Teeth”, "All-on-Four", "Diem 2", "Revitalize", Hybrid Prosthesis, Immediate Load, Fixed Implant Bridge, Fixed Detachable Bridge, Denture Bridge, Conversion Prosthesis, etc. Currently, this treatment is being heavily marketed in the dental community. The primary reason it is marketed so heavily is the fact that it can provide an excellent solution to those who are losing or have already lost all of their upper and/or lower teeth and want to avoid conventional dentures. A professional dilemma with this treatment option? 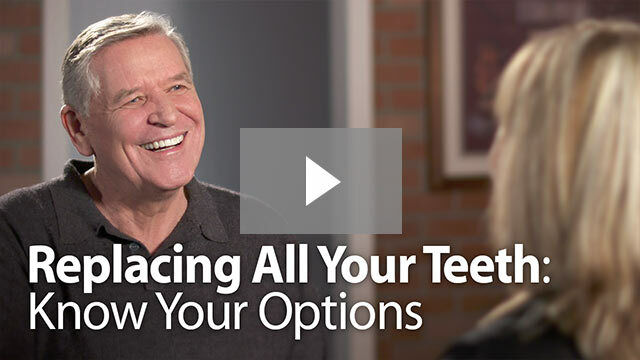 Dental implant companies are encouraging every dentist everywhere to offer this treatment to their patients because they know the value dental implants can be for so many people. The dilemma lies in the fact that many dentists want to provide this treatment for their patients, however they may not have received the proper training to adequately do so. In attempts to get some form of training, they will often attend weekend courses that provide limited and varying information regarding the process. The only formal education and training available regarding the history, techniques, literature/research, and clinical experience are found in advanced dental specialty residency programs. The most highly trained dentists with respect to this type of treatment are prosthodontists. Advantages of Implant-Supported Fixed Complete Prosthesis? Besides allowing replacement of all missing teeth in a dental arch, dental implants help prevent bone loss that occurs when teeth are lost. When no teeth are present the jawbone has no use, which leads to its deterioration. This shrinkage of the jawbone has esthetic consequences for your face (causing an older appearance), especially when missing all teeth. With the use of implant-supported prostheses, the bone is put to use, preserving it and your facial support. An implant-supported fixed prosthesis can replace both teeth and gum tissue. It looks and acts like your natural teeth. The prosthesis fits securely even when you chew and speak. In addition, they do not allow the opposing natural teeth to move and shift, protecting your bite and jaw joint. This full arch fixed prosthesis will not be removed except by your prosthodontist. Your new teeth will look and feel like your natural ones once did. An Implant-supported fixed prosthesis consists of several parts. Multiple (usually four or more) implants, which are made of titanium, are placed in the upper or lower jawbone to replace the roots of some of the missing teeth. The abutments, made of titanium, are attached to the implant with a screw. This part connects the implants to the prosthesis. A temporary (interim) prosthesis is made of an esthetic plastic material (acrylic resin) and screws into the abutments. Dense and strong full zirconia one-piece bridge (zirconia gum tissue and teeth). One-piece framework with individual porcelain or ceramic crowns cemented to the framework. This is the most expensive, but very easily repaired option. Oral Habits – Most commonly, whether or not the patient suffers from bruxism (clenching and/or grinding teeth) or Temporomandibular Disorder (TMD). This factor leads to consideration of more implants and may also influence the type of prosthesis material that is recommended. Often a night guard is recommended in these cases to protect both implants and prostheses from excessive forces. The opposing arch – Those with natural teeth have increased bite force. Therefore, if the opposing arch is natural teeth, usually more implants are required and vice-versa. For example, when the patient has an upper complete denture without implants opposing the fixed implant prosthesis, some cases only require four implants in the lower jaw to support the prosthesis, coining the phrase “all on four”. What does the Implant-Supported Fixed Complete Prosthesis process involve? The primary dental specialist in charge of leading the process and delivering this full-arch implant restoration is the prosthodontist. First, a full denture is prefabricated and duplicated to form a clear surgical guide prior to any teeth being removed. In most cases, an oral surgeon will remove all of the remaining teeth on the arch being treated and immediately place multiple (four or more) implants strategically around the arch using the surgical guide for implant position determination (a restorative-driven process). Next, the abutments are chosen and the prefabricated denture is converted into a full arch screw-retained acrylic resin temporary restoration. This lab conversion results in a beautiful temporary that will be worn for the duration of healing and integration of the multiple implants into the jawbone. Finally, after the three to six-month healing period, the definitive prosthesis is lab-fabricated over a series of appointments by your prosthodontist and a Certified Dental Technician (CDT). For a healthy individual with good oral hygiene, dental implants have reported success rates above 90-95 percent. Good oral hygiene is very important to the success of any implant-supported prosthesis. Although the implants and the restoration can’t decay, you’ll need to make sure the area around them is especially clean to prevent gum problems. Dental implant maintenance is important to avoid peri-implantitis, an inflammatory process that can damage the soft tissue and bone around implants. Repairs or replacement of the prosthesis is expected after many years of service. Just like natural teeth, an implant prosthesis can wear and break. The lifespan of these restorations often depends on many factors, including oral habits, like teeth grinding. In many cases, a night guard is indicated to protect your implants and prosthesis. The implants and prosthesis require regular at-home and professional hygiene maintenance just as natural teeth do. An electronic toothbrush and Waterpik water-flosser for at-home care and visit to your Registered Dental Hygienist every 3 to 4 months for dental mplant maintenance is highly recommended. Occasionally, the prosthesis may need removal from the mouth by the prosthodontist for a more thorough cleaning and re-polishing. For any further questions about implant-supported fixed complete prostheses please do not hesitate to ask us.